Zach Bogosian’s big contract leaves him available for the Golden Knights (Harry Scull/Buffalo News file photo). Zach Bogosian and Matt Moulson, a pair of big-money veterans, are available for the Vegas Golden Knights. So is young forward William Carrier. Those are the big takeaways from the list of players the Buffalo Sabres left unprotected as the NHL announced those available to be taken by the Golden Knights in this week's expansion draft. All teams' protected lists for the expansion draft were released Sunday morning. Vegas will select one player from each team and those choices will be announced Wednesday night as part of the NHL Awards Show. The Sabres protected Rasmus Ristolainen on defense along with Jake McCabe and newly acquired Nathan Beaulieu. That means left unprotected are veteran Josh Gorges and the duo of Justin Falk and Taylor Fedun that was signed last summer and played plenty of strong minutes when injuries struck the blueline. Forwards: Kyle Okposo, Ryan O'Reilly, Evander Kane, Marcus Foligno, Johan Larsson, Tyler Ennis and Zemgus Girgensons. Exempt as first- or second-year pros: Forwards Jack Eichel, Sam Reinhart, Alex Nylander, Justin Bailey, Evan Rodrigues, Hudson Fasching, Nick Baptiste, C.J. Smith, Sean Malone, Eric Cornel, Vaclav Karabacek and Jean Dupuy; defensemen Victor Antipin, Brendan Guhle, Casey Nelson, Erik Burgdoerfer, Devante Stephens and Brycen Martin; or goalies Jonas Johansson and Jason Kasdorf. The full list of Sabres available to be chosen is as follows: Carrier, Moulson, Bogosian, Gorges, Falk, Fedun, Nicolas Deslauriers, Brian Gionta, Derek Grant, Justin Kea, Cal O'Reilly, Cole Schneider, Brady Austin, Matt Bodie, Cody Franson, Dmitry Kulikov, Anders Nilsson, Linus Ullmark. Gionta, Kulikov and Franson are all unrestricted free agents available to be signed by Vegas but that is unlikely. The Golden Knights can sign UFAs around the league without waiting for the July 1 period but any signing would count as their expansion choice from that team. Carrier rates as a mild surprise. The 22-year-old, acquired from St. Louis in the Ryan Miller trade in 2014, had five goals and three assists in 41 games last season. 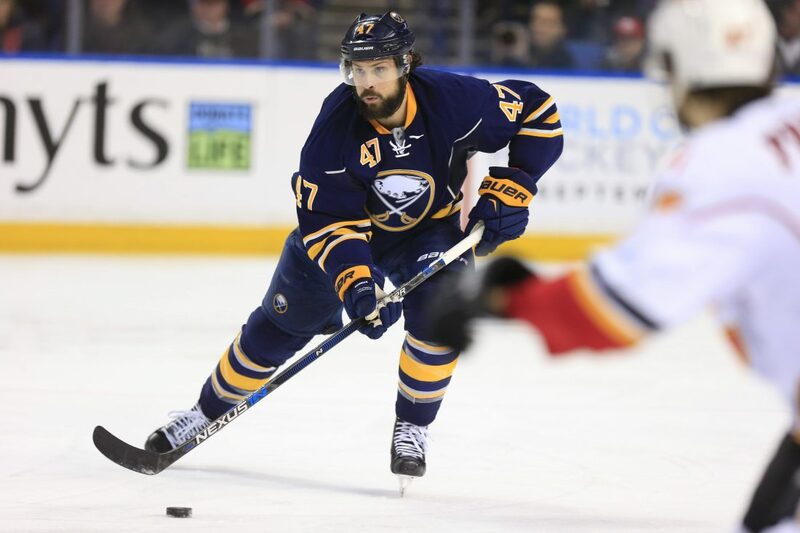 The Sabres' goal is almost certainly to shed a big contract. They're on the hook for $5.14 a year for the next three seasons with Bogosian and $5 million for the next two with Moulson. Gorges is owed $3.9 million next season. An early surprise on the unprotected lists around the league came from Florida, where the Panthers left leading goal scorer Jonathan Marchessault off their list. The 26-year-old tallied a career-high 30 goals last season. The top names available to be selected by Vegas include Pittsburgh goalie Marc-Andre Fleury, Carolina goalie Cam Ward, Chicago defenseman Trevor van Riemsdyk and forward Marcus Kruger, Dallas forward Cody Eakin, Detroit defenseman Niklas Kronwall and goalie Petr Mrazek, Florida defenseman Jason Demers, Minnesota forward Eric Staal and the Wild defense tandem of Matt Dumba and Marco Scandella, Nashville's James Neal, New Jersey's Mike Cammalleri, New York goalie Antti Raanta, Ottawa forward Bobby Ryan and Tampa Bay forward Cedric Paquette. Pittsburgh left several key pieces from its Stanley Cup teams unprotected in Nick Bonino, Chris Kunitz, Bryan Rust, Ian Cole, Trevor Daley and Carl Hagelin but all expectations are that Fleury will be Vegas' choice from the Penguins. With a glut on the blueline and the requirement to protect veteran Kevin Bieksa, Anaheim did not protect standout defensemen Sami Vatanen or Josh Manson. But it's likely Vegas has made a deal with the Ducks to not take either and with Florida to not take Marchessault in exchange for a draft pick or other assets. (Ottawa), T.J. Brennan and Michal Neuvirth (Philadelphia), Chad Ruhwedel (Pittsburgh), Chris Butler (St. Louis), and Cory Conacher (Tampa Bay). Stempniak's 10th team -- his seventh over the last four years. Clendening by the New York Rangers. Teams can only trade with Vegas until the league-wide trade freeze is lifted at 8 a.m ET Thursday. The Golden Knights figure to be very busy the next few days, and will undoubtedly made side deals with several clubs to stockpile picks for the Entry Draft Friday and Saturday in Chicago in exchange for an agreement to not take certain players in expansion.